You will earn 5,724 Reward Points. Earn 1 reward point for every 1 dollar spent. 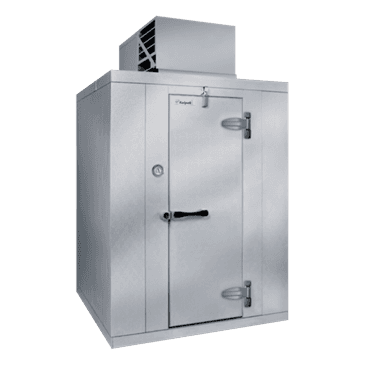 Walk-In Cooler, Outdoor Polar-Pak, 6'-6.25" H, 7'-9" W, 5'-10" L, floorless, 3/4 hp. medium temp (+38F) top mounted unit, 26 ga. embossed galvalume interior & exterior, 4" metal screeds with base cove, 2" dial thermometer, supplied with roof cap & accessories for flashed or free-standing applications ***Outdoor Polar Pak systems will not be available for areas where winds exceed 110 mph and/or the snow loads are above 20 psf. NOTE: Outdoor Polar-Pak requires outdoor package for refrigeration & roof sealing system. Outdoor units require a field supplied & field installed condensate drainline (including heat tape on freezer drains). 115v/60/1ph, 16.3 amps, 3/4 hp. (standard voltage) 208-230v/60/1ph, 3/4 hp.